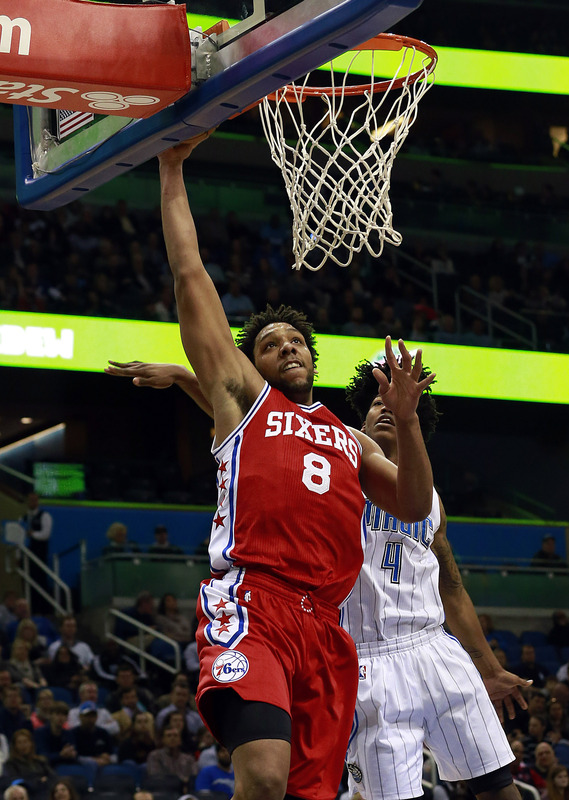 Orlando, Fla. –The Orlando Magic’s 112-111 home loss to the Philadelphia 76ers on Thursday was a perfect window into two franchises in transition. The Magic started the season with playoff aspirations and a veteran core. The Sixers began with a promising young nucleus of high draft picks and hopes for progress. Now both teams sit in the bottom three of the NBA’s Eastern Conference. This game begat only pride to the winner and better draft positioning to the loser. It was fitting, then, that Sixers’ T.J. McConnell’s game-winning tip-in captured it all – the Sixers’ rise, the Magic’s fall, and a whole morass of confusion between them. The Magic led 105-98 with 3:30 remaining in the game. After leading by as many as 15 points, and holding the Sixers to a mere 42 percent from the floor, it seemed like the home team could comfortably coast to a win. But coasting is exactly what would get them in trouble. “I think we played like we’re some kind of 60-win team playing against a bad team,” said Magic coach Frank Vogel. The Magic squandered that lead, resulting in multiple late-game lead changes. The last few seconds were a confusing mess, and one that baffled coaches, reporters, and even the referees. With Orlando leading by one, former Magic man Ersan Ilyasova’s three-pointer was blocked by Nikola Vucevic. The ball flew out of bounds in a flurry of activity, and the referees were unable to determine who last touched it despite multiple reviews. The jump ball between Evan Fournier and Ilyasova ended up in McConnell’s hands, and the Sixer point guard made yet another game winning shot on the season. That jump ball was a nightmare scenario for Vogel, who could put neither his offensive or defense lineup in the game without a timeout. Each team was missing its most promising star, both of who were separated by just one pick in the 2014 NBA draft. The Sixers’ Joel Embiid missed his eighth-straight game with a knee injury, while Aaron Gordon was out with a sore foot that he suffered in Tuesday’s loss to the Rockets. Gordon’s injury looked to spell an expanded role for second-year wing Mario Hezonja, who shockingly earned his first start of the season as a fill-in. The start didn’t amount to much difference in playing time, however, as Hezonja amassed a very typical 18 minutes. Evan Fournier had a bit of an up and down game as he nearly netted his first career triple-double with 24 points, nine rebounds, and eight assists. The Magic’s last possession died Fournier’s hands, however, as he committed his sixth turnover in the chaos following McConnell’s layup. The Orlando Magic (20-35) will hit the road for another seemingly winnable game on Saturday, a showdown with the Dallas Mavericks (20-32). The Mavericks have seen a resurgence of late thanks to rookie point guard Yogi Ferrell, beating the Utah Jazz in overtime on Thursday night.